London 2012 double gold medallist Natasha Baker and winner of ParalympicsGB’s first medal at London 2012 Mark Colbourne today joined Paralympic champion Jonnie Peacock in pledging their support for the ParalympicsGB Sports Fest, the first ever Festival of Paralympic Sport. The Sports Fest will provide information and come-and-try opportunities on both summer and winter Paralympic sports, as well as opportunities to meet medallists from London 2012. The BPA is working with National Governing Bodies and other key partners such as the Home Nation Disability Sport Federations to provide information to all comers on how to get involved, including those interested in getting involved in wider areas such as coaching and volunteering. Mark Colbourne was a keen sportsman before he broke his back in a paragliding accident in May 2009. “I am happy to be supporting the ParalympicsGB Sports Fest, because I believe that sport has really changed my life”, he said. “I was a very active person before my accident and being active was really important to me. So I was already a big believer in the positive influence that sport can have. But after I was injured, I wasn’t sure how active I could be and I was nervous about putting myself out there. I would say to all disabled people who aren’t sure about sport or who are worried, just give it a go and see what happens. It can be difficult to overcome all those worries but it is worth it if you find something you really enjoy. Once I’d built up the nerve to try disability sport, I had a go at several different things before I found something that I really loved: cycling. 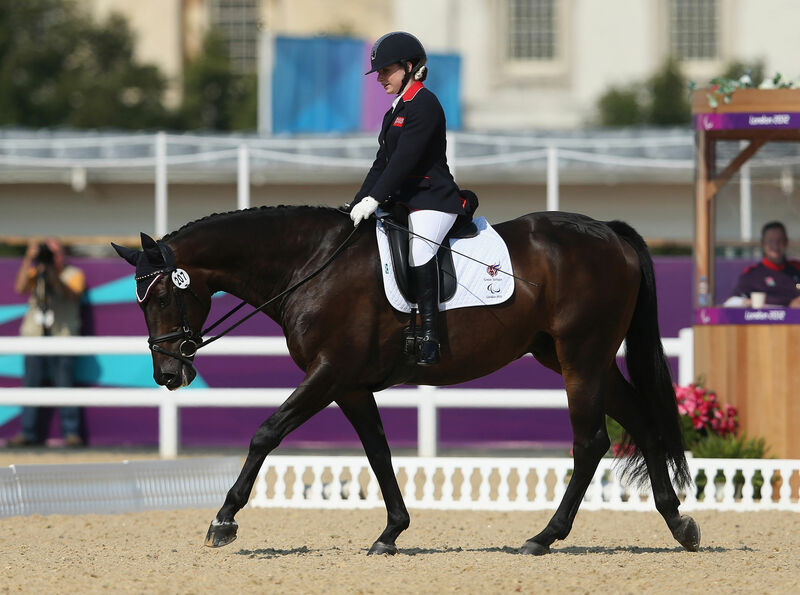 Natasha Baker took up riding after watching Lee Pearson compete at the Sydney Paralympic Games in 2000. After being inspired herself to take up sport, she is keen to do the same for others. “I remember very clearly watching the 2000 Paralympic Games on TV and saying to my parents ‘I want to do that’”, says Baker. “I found my local club and went from there. Now I’ve got two gold medals! I can’t put in to words how much sport has influenced my life. Obviously I train hard so it takes up a lot of time, but sport has had a positive impact in other ways, such as helping me build my confidence. I really hope that there are people out there who watched me, or other Paralympians, compete in London and who have turned to their families or friends and said ‘I want to give that a go’. To all of those people, I’d say please register for the Sports Fest. It is a fantastic opportunity to find out more about lots of Paralympic sports in one go – including equestrian – and to see how you can get involved. Baker and Colbourne are the latest Paralympians to support the Sports Fest, after T44 100m gold medallist Jonnie Peacock announced his support as part of the launch of the event last week, while numerous Paralympians have shown their support for the Festival on social media network Twitter. BPA Performance Director Penny Briscoe is pleased that the Festival has attracted high profile supporters. “It is great to see that the Festival is being well received by the athletes and that we have fantastic athletes such as Mark and Natasha who are supporting it. These are athletes who have watched the Paralympic Games, been inspired by the achievements of Paralympians, and decided to give disability sport a go. Now they have represented their country on the biggest stage of all and won Paralympic gold medals. Mark and Natasha are therefore perfectly placed to encourage other people to try out sport, because it is a path that they have been on themselves. “We are not expecting everyone who comes in the door to be a future Paralympian, but we do hope that the achievements at London 2012 will inspire more disabled people to get into sport. We always encourage people to give sport a go, whether you want to compete at a high level or whether you just want to go to your local club once a week. Included in the programme of activities for the event, which is free to attend, are either come-and-try sessions or information stands for almost all of the 22 summer and three winter sports in the Paralympic Games as well as other key partners such as the English Federation of Disability Sport. In addition, the BPA can confirm that Natasha Baker will be one of the gold medallists in attendance on the first day of the Sports Fest, while Jonnie Peacock and Mark Colbourne will both be among the medallists present on the second day of the event. The Sports Fest will be held at the Surrey Sports Park in Guildford on Monday December 3 and Tuesday December 4.